One of the goals I perpetually make is to become more organized than ever. This often ends up conflicting with my goal to obtain financial freedom and encourages me to spend money. I have so many ideas on home storage solutions and read about more on a daily basis but all of these plans usually include purchasing more baskets, bins, and holders so that everything has a place. In years past I have allowed the organization goal to be left unfulfilled in favor of more money in my bank account, but this year I’m trying to reach a happy medium between the two. While cruising Pinterest I saw tons of tutorials on DIY boxes, Modge Podge, and scrapbook paper. It sounded easy enough but I’m convinced I did something wrong because my two attempts both landed in the trash. Reusing existing boxes for storage isn’t a new concept. The basement of my grandma’s house in Colorado was loaded with just about any box she could get her hands on and she had a plan for every box. Living in Texas, there aren’t basements so my the thought of organizing with plain boxes does not sound appealing. So began the brainstorming process of other ways to cover a box. After trying and failing using wrapping paper and Modge Podge, I decided Modge Podge and I need to part ways. At least on this project. Inspiration struck while shopping in Target. In the cleaning aisle there was a variety of shelf liners including an eye catching black and white design. At less than $6 for 18 feet of self adhesive shelf liner, this seemed like a bargain and the perfect solution. Coincidentally I just purchased eight boxes of baby wipes on clearance (total savings according to my receipt $51) so all of my DIY boxes are uniform and work together quite nicely. In all, I covered 9 boxes for $6 – only $0.67 each! This project is just so simple but really can bring order to your home and life! All you need is a box of your choice, a utility knife, scissors, and shelf liner. Select a box sized to fit your needs, then using a utility knife cut off the flaps along the creases. If you’re going to line the inside of your box, I’d suggest doing that first so the outer pieces of paper cover up and seams. Set your box on the shelf liner(adhesive still in tact) and wrap around the bottom of your box. Taking the time to measure the piece now will assure minimal cuts and seams. If you’re not lining the inside of your box I suggest a 2-3″ overlap on each side to give a finished appearance. When you have your piece measured, go ahead and cut the shelf liner. Place the box on the paper and make a crease along the top side of each opposing side of paper. Because of how you measured the box, it will cover three sides. You have two options at this point: (a) remove the adhesive backing and begin applying while smoothing out air bubbles or (b) cutting small slits in the corners of the paper where it will fold over the edge of the box. Cutting ahead of time makes it easier to line up and fold the shelf liner over the box when you get to that step but it does make removing the adhesive backing a little trickier. Smooth the shelf liner across the surface removing any air bubbles along the way. To finish your box, measure the uncovered sides. You likely had extra shelf liner folded over when placing it on the other sides so you only need to cut enough additional shelf paper to cover the cardboard and the buffer for the top edge. Unless you want to add any additional embellishments or labeling, you’re all done! Do you have any creative ways for creating beautiful, yet affordable storage? Ahhhhh! Thank you so much for sharing! The result is gorgeous. I need to attempt this. So cute! I’ve had trouble with Mod Podge, too. I switched to a spray adhesive with much better results. Though I imagine your self-adhesive liner was even easier! Love how they turned out. This is such a great idea! And I have a bunch of that shelf liner paper left from when I lined our cabinets with it after we moved in. What a fantastic idea! I’ve never thought of doing anything like this before, but now I definitely want to try it! I’ve done this with shoe boxes and wrapping paper. Great! love this idea! i have a ton of those boxes. now i know what i can do with them. I have thought of doing something like this but never got around to doing it. Thanks for sharing. I’ve done this and it’s so great! I’ve even given them at baby showers as part of the gift! I love this idea, and putting them on shelf will make the shelf look so cute!! I keep saving our diaper boxes to do something like that and my BF keeps throwing them away LOL. I like this – great idea. I’ve done it before with duct tape. What a great idea! 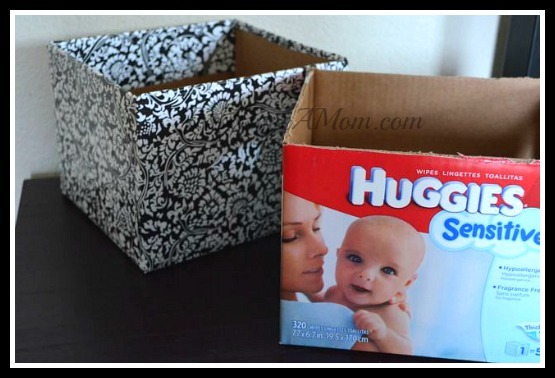 I tend to use diaper boxes but I haven’t covered them up all cute- that’d make a huge difference! I have a ton of boxes around my house I could do this with. That is a great idea! Thanks for sharing. Gonna hang onto a few boxes and give this a try. I have a ton of stuff I could hide in cute boxes. Thanks so much! I’m always looking for inexpensive storage solutions. What a great idea, and they look amazing! I always recycle my boxes, but I still feel like it’s such a waste. That is such a good idea. I have four kids and it seems like I never have enough storage boxes for them. Thanks for the great tip! AVON boxes would work really well, too. 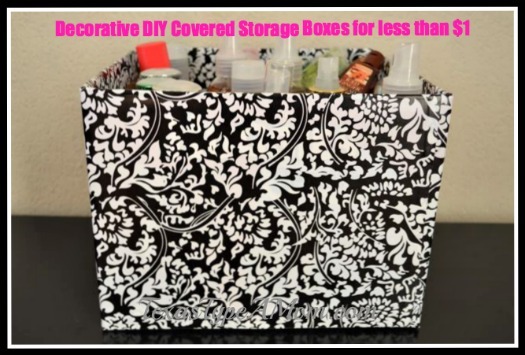 I love this idea…not only would it make my storage area prettier, but it would encourage me to organize more! Beautiful box. And now that you mention it, I’m in Texas too and have never come across anyone with a basement. Super cute idea! Lord knows I have TONS of diaper boxes to spare too! I’d love to use this idea for my classroom.